This sinfully rich pound cake is dense and moist and grows more flavorful as it ages. It gets its subtle maple taste from the addition of Maple Crown Royal whiskey. (No, I’m not getting a kickback from them, and yes, I’ll give you non-alcohol alternatives.) It has a delicate crispy crust from coating the pan with sugar before adding the batter, and I kicked the sweet maple flavor up a notch by using maple sugar— but that’s just me; I can never get enough maple! I played with the icing on this cake. On my first attempt, I made a ganache from maple morsels (something new on the market) and was less than impressed. So I went back to my trusty brown sugar icing and spiked it with maple whiskey. Much better! If you have a little of this icing left, and you haven’t just eaten it with a spoon, try adding a spoonful to a cup of hot coffee. I like my coffee strong and black, but I’ve got to say, this was delightful. Go ahead and refrigerate it if you want; it’ll cool the coffee down a bit when you add it. You may even want to double the recipe! Prepare a 10-inch bundt pan by coating it generously with vegetable oil (or coconut oil or shortening - don't use butter!) and then sprinkling thoroughly with sugar. In a large bowl, beat the white sugar, brown sugar, and butter together for 3-4 minutes. The mixture should lighten in color. Add the eggs, one at a time, beating thoroughly and scraping the sides of the bowl with each addition. Take your time! It should take you several minutes to add 6 eggs. 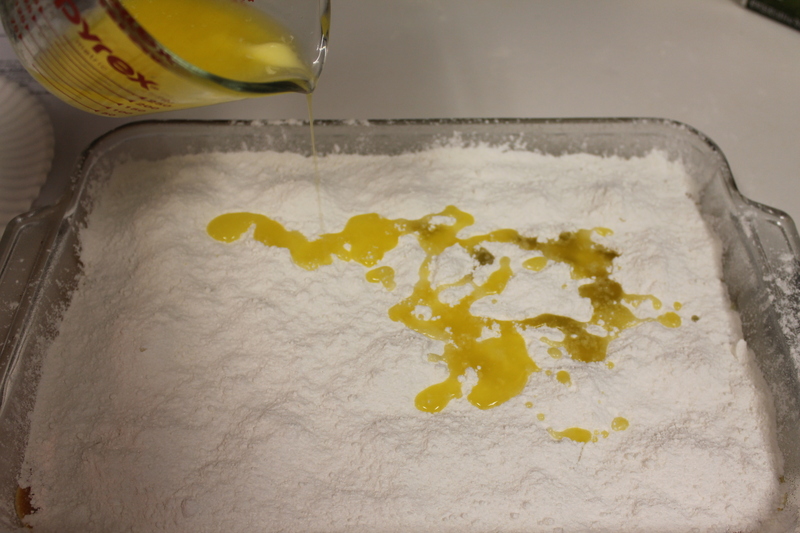 Add the liquid and dry ingredients alternately in three additions, beginning with the dry ingredients and ending with the liquids. Beat just enough to combine each time, taking care to scrape the bowl down often. Spoon into prepared bundt pan carefully so you don't disturb the sugar on the sides. Smooth the top and bake for approximately 1 hour 20 minutes. The top should be rich brown and a long toothpick inserted in the cake should come out clean. Allow cake to rest on cooling rack for 10 minutes, then flip it over. Wait a few more minutes before lifting off the pan. Let cake cool before making icing. ICING: Put brown sugar, milk, and butter in a medium saucepan. Turn heat to medium and bring to a boil, stirring frequently. Once it boils, let it cook for 2 minutes without stirring. It’s important to let the butter and eggs come to room temperature. Coat a bundt pan with vegetable oil or coconut oil and sprinkle liberally with sugar. I used maple sugar for added flavor, but regular sugar is great; it’ll give a crispier sugar crust to the cake. Beat butter and sugar well, then add eggs. One.At.A.Time. Don’t be in a hurry here! Last egg. See how fluffy the batter is? Add dry and liquid ingredients alternately, then spoon into pan. Spread gently and bake. Cool for 10 minutes, then turn the cake over and let cool a few more minutes before lifting the pan. Make icing. Add whiskey and powdered sugar to the boiled mixture and whisk it like you mean it! Once the cake has cooled, pour the warm icing over it. Keep this covered on the counter (don’t refrigerate) and enjoy it slice by slice. It just gets better and better! Dump cakes are new to me. Whenever one would pop up on Facebook, I’d just move along because why would anyone want to eat something with the word “dump” in it? Seriously, can you think of a single positive connotation? Besides that, they use a boxed cake mix, which I try to stay away from. When I was experimenting with homemade make-ahead cake mixes for my October Food for Thought column (which will be up on October 2) the logical thing to test it on – besides a cake – was a pumpkin dessert. 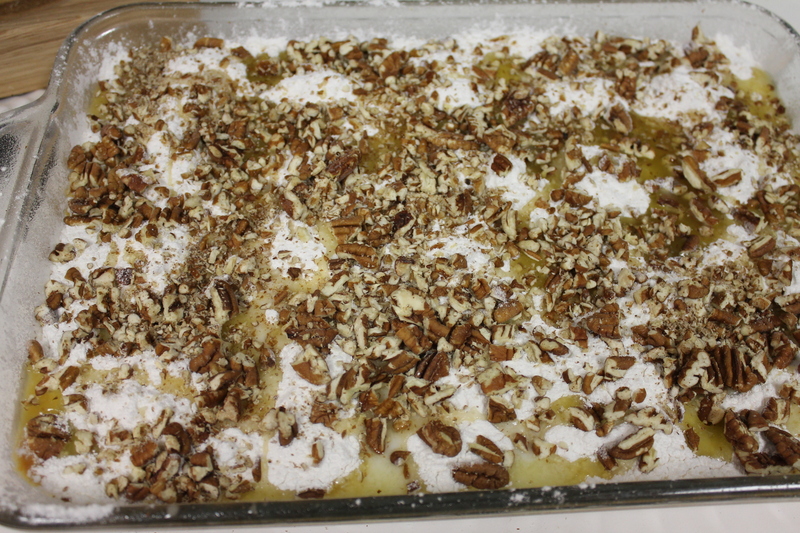 I wheedled the recipe from the lady at club, added pockets of cheesecake to the recipe and used lots of pecans. I also may have topped the warm dessert with a scoop of maple nut ice cream. And I was, for once, speechless. It was beyond good. My personal preference when it comes to desserts is for something plain. A slice of angel food cake. A brownie. A bowl of ice cream. I have no problem with making complicated recipes – the harder and more involved it is, the more I enjoy the process – but I would rather eat something simple, and this was just so…busy looking. Honey, let me tell you – looks aren’t everything. The complex flavors will make you weep. I’m sure I don’t have to tell you how to make the filling for pumpkin pie, right? You just grab a 15 oz. can of Libby’s solid pack pumpkin and follow instructions. Or you buy the pre-made kind in a can. Or you follow your grandma’s recipe with condensed milk or whipping cream and brandy. 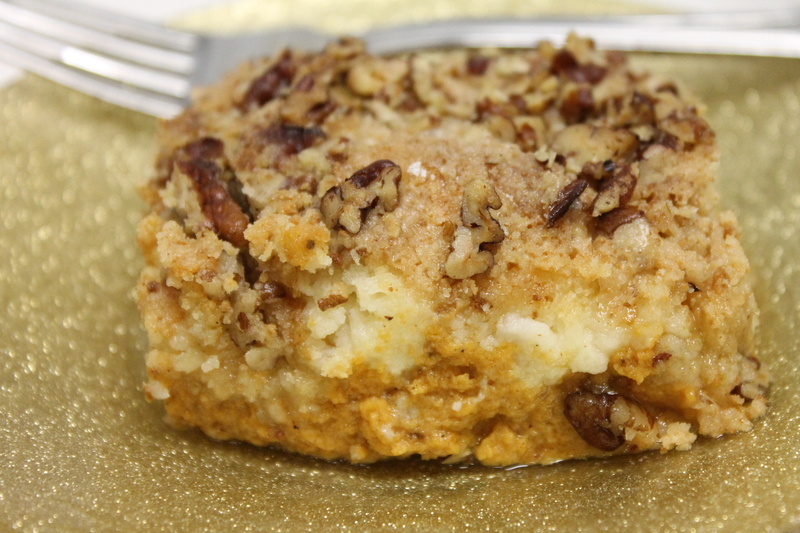 The foundation of this dessert is a batch of pumpkin pie filling. Covered with dollops of cream cheesy goodness. Suffocated with a thick layer of dry cake mix. Drizzled with melted butter. Adorned with pecans. What’s not to love? If you must use a boxed white cake mix, that’s OK. If you would like to make yours from scratch, here’s a small version of my cake mix. You’ll use about 1/2 of this (my cake mix is a little more generous than the packaged kind). Save the rest in an airtight container for your next dump cake, or check out the October Yummy column for the full cake recipe. Thoroughly whisk together all ingredients. Use half of this recipe for topping a dump cake and store the rest in an airtight container at room temperature for up to 2 months. Serves 12 A scoop of ice cream is lovely over this warm dessert. 1 package white cake mix, DRY! Grease and flour (I use Baker's Joy spray) a 9x13 cake pan or casserole dish. Spread the pumpkin pie filling evenly in the bottom of pan. Cream the cream cheese, powdered sugar, flour, vanilla, and egg together well. While beating, slowly add the milk a little at a time. You may not need all the milk - it depends on the size of your egg. I use jumbo eggs and 2 tablespoons was just right. The goal is to have the mixture the texture of thick pudding. Drop the cream cheese mixture in rounded tablespoons over the pumpkin. Take a knife and pull it through gently. 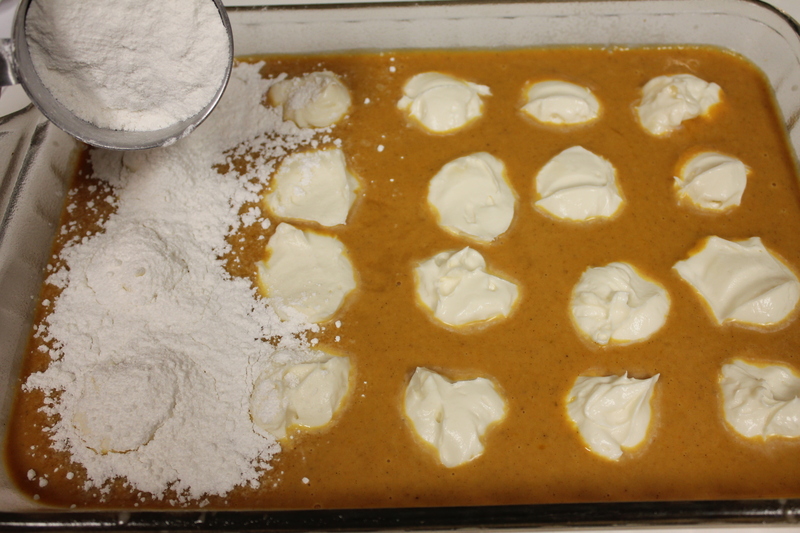 You don't want to mix the pumpkin and cream cheese...you just want to have it evenly distributed. Another option would be to put the cream cheese filling in a zipper bag, cut the tip off, and pipe it all over the pumpkin. Cover completely with dry cake mix. Drizzle evenly with melted butter. Bake for approximately 1 hour. Let it cool on a rack and eat it when it's barely warm. Drop globs of cream cheese mixture over the surface OR use a zipper storage bag with the tip cut off to squeeze it evenly over the pumpkin. I always get excited about new recipes (I wish I could be that passionate about housework) but this one has really stolen my heart. It is my new go-to Fall “company vittles” dessert, and will probably take the place of pumpkin pie for Thanksgiving. Now that I shared my new addiction with you, may I ask for a favor? Pretty please? I’m one of the top 13 finalists for Blogger Idol, and just finished my first assignment which will go live at noon on Wednesday, October 2nd. Would you please check it out and vote for me? Thank you, Foodie Friends!